Even a year ago, I think if you had told me I would be wearing a mini dress and trainers and calling it *fashun* I wouldn’t have believed you. While I’ve long admired how effortlessly stylish some people can look in a suit, floaty midi skirt or maxi dress with chunky trainers I’ve never felt it’s been a style that I can carry off myself. That’s not to say I haven’t tried, but every time I have I’ve just felt it makes me look like I’ve slipped on the nearest pair of shoes before taking the bins out! 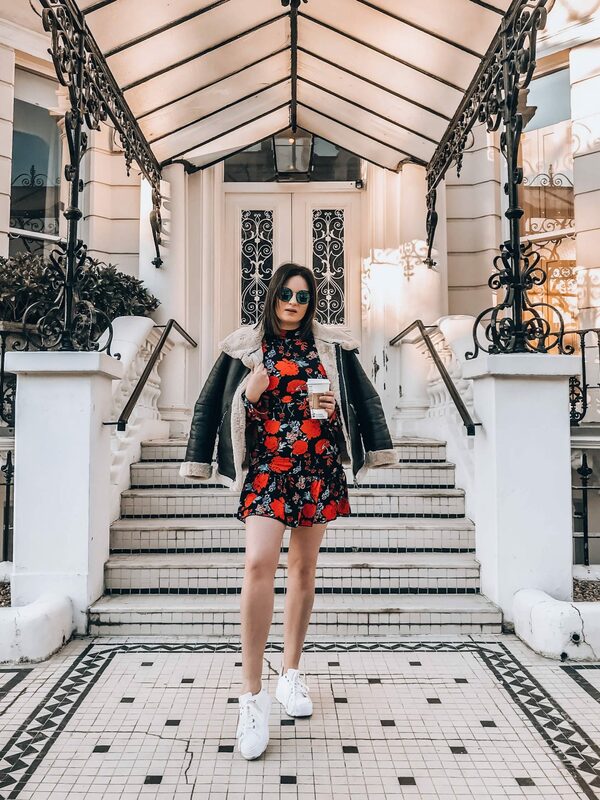 Well, that was before I discovered this dreamy combo – a red printed floral mini dress with chunky white trainers. So, from now on this is how I’ll be wearing trainers in a non-casual, stylish way. 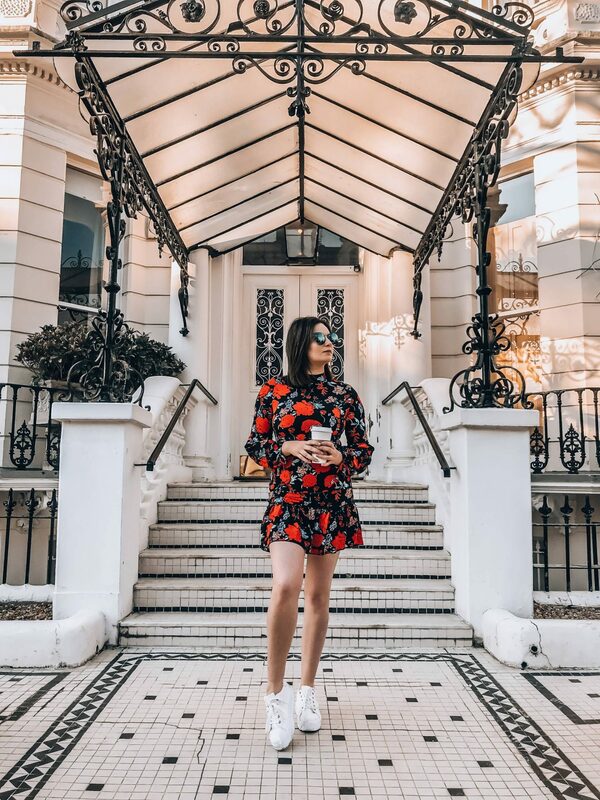 How gorgeous is the print of this dress? I fell in love with it as soon as I saw it on ASOS and I just had to make it mine! I also love the high neck, long bell sleeves and drop hem. 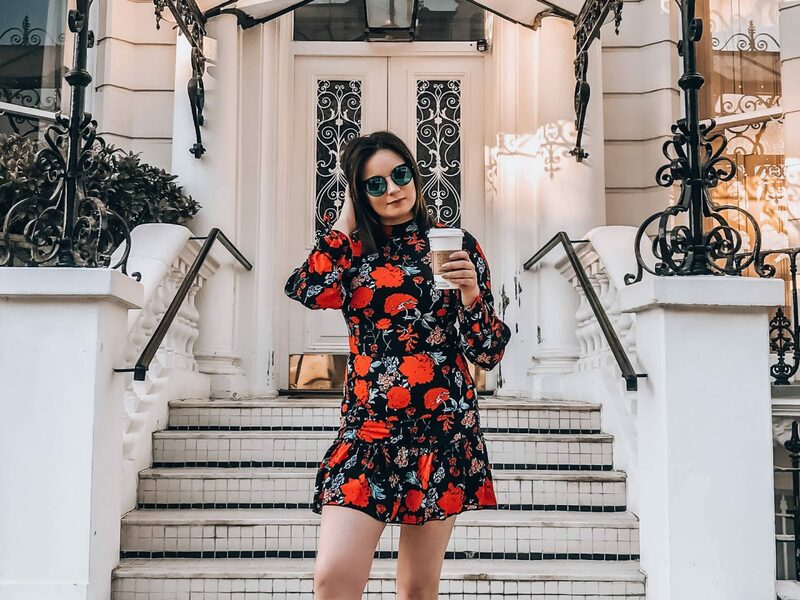 Together, all of the elements of this dress really work and make it the perfect dress for Spring weekends. As a tall girl, trainers are often my best friend – otherwise I feel like I’m towering over my friends! These chunky trainers are from KOI and I love the way they look and how they go with practically everything in my wardrobe. The platform of the trainer makes them feel just a bit more fashionable than standard white trainers. You’re probably sick to death of hearing me talk about this jacket (I basically wear it every day) so I won’t linger on it too much! I got it in the Primark sale for just £15 and it was such a steal! The faux fur and black faux leather are a classic combo and throwing it over any outfit looks great. "A trio of Alpha H products for perfect skin"
"Bots, shady tactics and ‘cancel culture’"